Negative Entropic Quartz Crystals. What are they? There's a buzz phrase in the world of crystal healing...Negative Entropic Quartz. 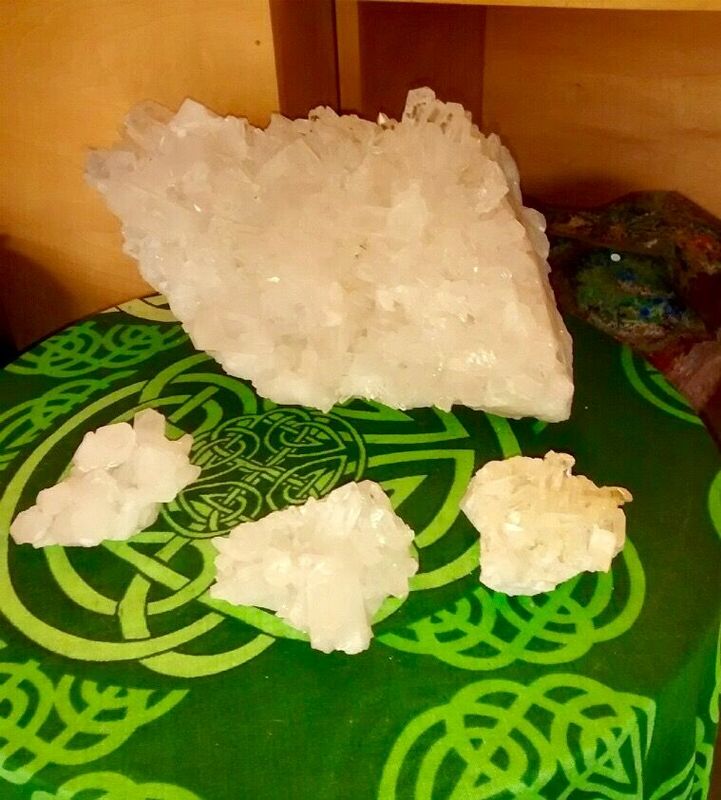 There are a number of different types of quartz crystals differentiated by mineral content and formation such as Generator crystals, Transmitters, Channelers and Elestials among other Master Crystals. Each formation generates a different energy and specializes in working with various human elements. Information about this quartz energy is being channeled and received called Negative Entropic. So what is Negative Entropic Quartz? The crystals can be found in a quartz vein from Mt Ida, Arkansas all the way up to Brokenbow, Oklahoma. Some time during their growth history they were traumatized so severely that several fractures occurred within the typical structure which gives them a "sparkly" appearance. Some say they appear to be of the stars, reflecting the light of the universe. The clusters have a "sugary" coating of smaller crystals, which continue to generate new crystal growth. Some clusters have a small dark nodule on the underneath side. These nodules seem to contain "source energy" and are the crystals that tend to have most of the "sugary" crystals attached. They don't appear to be the most beautiful crystal formations and are more "utilitarian "in their purpose--but power packs they are. In addition, Negative Entropic clusters will usually have a greater amount of re-healed crystals (due to all that trauma) plus several double terminated crystals in the grouping. A double terminated crystal encourages energy to flow both ways. Some clusters will also have crystals that have a very rare and unique 2 or 3-sided Isis formation. The Isis formation is known for producing goddess energy and emotional healing. The special significance of the number 3 adds the elements of balance and trilogy to all that energy. Individual crystals that have detached and separated from the clusters have much more specific energy, but are definitely still part of the whole. This special quartz energy is said to be capable of regeneration on many levels thus the name Negative Entropic. To better understand the energy of the crystals we need to get down to the basics of the words in their name. Entropy n. A measure of the disorder or unavailability of energy within a closed system. Two great processes operate in all systems, be they cells, humans or what ever: 1) entropy, in which energy is decreasing and disorder increasing, and 2) negative entropy in which energy is increasing and disorder decreasing. Negative entropy is thought to be the critical choice for humanity at this time in history. This is a chosen path of conscious evolution: do we unconsciously follow the groove of cultural, social and religious entropy, or do we marshal the forces of Life, the great force of neg-entropy in the universe? In order to optimize the universal life force in our own lives, we have to become responsible for all of our own actions including health and healing. We have to whole-heartedly embrace a neg-entropic life. This is the great gift of the Negative Entropic Crystals. They enable us to reverse the forces of entropy in our own bodies and in our lives. To put it simply, these beautiful crystals can help you regenerate your life and energy. Their energy regenerates itself by continuing to grow even after being removed from their natural growth environment. They can even be programmed to heal using this unique energy source. Start your path of regenerating goodness and health in your life by owning your very own special Negative Entropic Crystal.